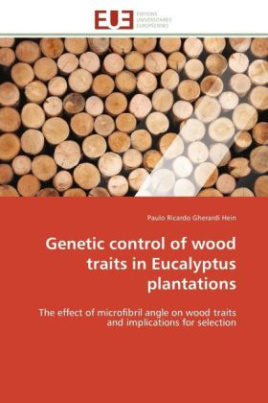 The genetic control of microfibril angle (MFA) and the genetic correlations of MFA with other wood and growth traits are poorly documented for Eucalyptus. The objective of this work was to determine the heritability of MFA, wood density ( ) and stiffness (E), and growth traits from clonal and progeny tests of Eucalyptus in Brazil and Republic of Congo. Resonance, X-ray diffraction and NIR spectroscopy were combined to evaluate the wood traits. The heritability estimates were moderate to high for MFA, , E, Klason lignin and growth traits according to the spatial position within the tree and the experimental design. Genetic control of MFA, and E, and their genetic correlations with circumference at breast height varied with age. The results suggest that tree with potential to grow fast are genetically more prone to produce low and also to decrease the MFA for ensuring stiffness required for their development. Most wood properties were genetically negatively correlated with growth, although favorable genetic correlations between many wood traits were observed. The implications of these findings for selection strategies are discussed according to the final use of Eucalyptus wood.